As many of you have already noticed, Airbnb bookings are coming in (via the calendar import) without any guest name, phone, email address or other details on them. This is happening because, sometime yesterday, Airbnb changed their calendar sync engine (the iCal feed) to remove all of the guest information. They have not offered any explanation for this; the guest info just disappeared. They still show the Airbnb reservation # and dates but nothing else. Will Airbnb put the guest information back in the calendar sync? We don't know. It's possible that this is a temporary glitch and Airbnb will fix it soon, but that's a pure guess on our part. If you have a contact at Airbnb, try reaching out and asking about this. Many PMs are part of a "Airbnb PM support group" that you can email directly with questions - see what they say. Our guess is that Airbnb did this, on purpose, for security or privacy reasons. Frankly, it was always strange that Airbnb included the guest's phone number and (proxy) email address in the calendar feed. This is unusual for iCal feeds. No other major channel did this except for Airbnb, so it was probably a matter of time before they plugged the hole. How do I get the guest's name, phone and email? Two words: Channel Bridge. Our Channel Bridge tool will continue to find and download everything about the booking regardless of what the calendar import (iCal) includes. The reason we created Channel Bridge was precisely for situations like this - VRBO and Airbnb do not provide users with guest and booking data, and the data they do provide is often incomplete. Channel Bridge attempts to correct this problem by logging in to your channel account, as the user, and normalizing and downloading all the information possible about the booking. We are continuing to make Channel Bridge better. We are days (hours?) away from releasing a "manual mode" for Channel Bridge that will allow you to make manual tweaks to the charges that Channel Bridge creates in case you need to fix something. We are working on a "direct injection" process where you can bypass the Excel file download and have Channel Bridge do direct imports. We are also designing a future "auto" mode that will run every 10 or 15 minutes on your machine. So lots in store for Channel Bridge. We are tracking updates to this Airbnb sync issue on our forum here. So if you want to ask questions, to us or other OwnerRez users, or provide updates that you find on your end, please do that so everyone can stay on the same page. New Years is a great time to look back on the year and plan for the next year. While reviewing our blog, I realized that we've added so much new functionality to OwnerRez, but hadn't always announced it here. So I figured I'd take a quick trip down memory lane and put together a list of the major items we added this year. Adding channel integrations was our primary focus in 2018. We started off the year with a bang, adding booking.com API integration and Channel Bridge booking import for HomeAway and Airbnb. More recently, we've rolled out TripAdvisor API integration and have been hard at work on HomeAway API integration (due out by February). "API integration" refers to a preferred communication method between our servers and the channel's servers. All API integrated channels can push rates and availablity automatically as well as receive bookings back from the channel automatically. All channels have percentage based rate adjusters which allow you to increase the rates on a per-channel basis. Some API integrated channels can also push listing content (description, amenities, photos, rules etc. ), receive inquiries, or integrate with the platform messaging. HomeAway, Airbnb, and TripAdvisor all have a 5+ property minimum for API integration (Booking.com and CanadaStays do not). Booking.com - This integration can push rates and availability and receive back bookings (including verifying credit cards to make sure they're valid and then automatically processing payments). Channel Bridge booking import - For HomeAway and Airbnb. Downloads full guest info, invoice charges, guest fees, host fees, payments, and channel remitted taxes and populates that data into your OwnerRez bookings. TripAdvisor - This integration pushes rates, availability, and full listing content and receives back bookings. 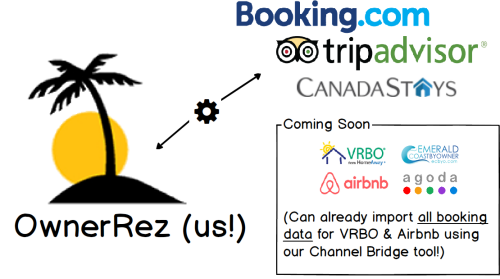 VRBO/HomeAway - This integration is a full integration that pushes content, rates, rules, everything and receives back bookings to OwnerRez. This currently in testing with a small group of pilot users but will be available to everyone in February 2019. VRBO rate push - Same thing with VRBO. You can configure a VRBO Sync Channel in OwnerRez and push your rates (and fees and taxes) to VRBO. This only works if you have calendar rates in VRBO and not the older "period" rates system. Contact VRBO to change you over to calendar rates. Centralized API Integrated and Synced channels - Channels, iCal, inquiry parsing, custom channels etc. used to be spread around OwnerRez in different areas. It is now centralized in the Channel Connections area under settings. Early in the year we did a big overhaul that took the scattered contact info and centralized it into the concept of Guests. Each inquiry, quote, and booking has a Guest, tying them together and allowing you to manage the contact info in one place. You can also merge guests and bookings together to keep track of repeat guests, as well as picking an existing guest when generating a new quote. Specific amount when making a payment request - Prior to this, you could only request a scheduled payment amount. You can now give an amount (and optional description) when sending a payment request to the guest. This is also accessible as an email merge field link so you can set up automatic payment requests and triggers. Request Booking Clean-Up - On some channels, it's common to request a rental agreement signature and a credit card for the security deposit. This request option (and email merge field link) lets you request both at once, reducing the amount of work the guest has to do. Request Review - You can request a guest review through the Reviews tab on a booking, or create a trigger with the merge field to automatically request a review. Custom Travel Insurance Amount - We added the capability for you or the guest to specify the amount of coverage when purchasing Travel Insurance. This lets you remove items that shouldn't be covered by travel insurance, let guests purchase insurance for channel bookings even if you don't have the financials imported to OwnerRez, and guests to purchase additional insurance for other related items like flights. Separate Platform Email - For channels like Airbnb, TripAdvisor, and booking.com, you get a "platform email address" with the booking, not the guest's real email address. We've separated that out into a Platform Email field. When sending emails, the system first tries to send to the guest's real email address. If none are available, it will send to the Platform Email. If you want to always send to the platform email, you can add the platform email address merge field to your email templates. Ever since we rolled out our hosted website feature in 2016 we've been continuously improving and refining it, and this year was no different. Search widget filters - Enable filters for dates, guest counts, location, beds/baths. Search widget calculate stay total - You can now set the search widget to calculate the booking total for the dates and guests entered vs. just displaying a rate range. Search widget passes data to booking widget - When you search with dates, the widget will prepopulate the inquiry widget with those dates so the guest doesn't need to enter them again. Search widget tile view - You can now show a Tiled view of properties in the search widget in addition to the default List view. HTTPS standard on hosted - Security on websites is big, particularly with Google's emphasis on "Secure" or "Not secure" in the address bar. We added support for HTTPS earlier this year. We just rolled out a feature that makes HTTPS standard on all hosted websites. Notification email on book now - In addition to tracking events in any Google Analytics or Facebook Pixel accounts you have connected to OwnerRez, you'll get a notification email when they start the book now process so you can follow up with the guest if they abandon the reservation. Multi User Widgets - This allows you to combine properties from multiple OwnerRez users into one widget -- useful if you want to create a central link for owners in your area to share with guests that they can't help. Perhaps they are reserved for those dates and want to recommend others -- now they can just share that central widget that you have created with the properties of all OwnerRez users in the area. Currently requires us to set up that authorization, so contact us if you need this. We refer to the general improvements we make as "quality of life" enhancements. Here are the big ones this year. Add to Home Screen - We've always been mobile friendly, but this year we develope an app based on Progressive Web App (PWA) technology. You can add OwnerRez to your homescreen on all major devices, including iPhone, iPad, Android phones and tablets, even Chrome OS and Windows desktops. Read our guide to adding OwnerRez to your phone's home screen. Batch booking cancel/delete - Sometimes you just need to clean up bookings or redo your calendar. You can use the Batch button on the Booking List view to select many bookings or blocked-off times and cancel or delete them all at once. Ribbon filtering - If you have many properties, the ribbon view becomes very handy. We've added filters so you can focus on a specific group of properties and/or bookings as you use the Ribbon view on the Bookings tab. Saved filters - If you filter any grid in OwnerRez, it will save that filter and load it when you return to that grid. You can also easily show all items or reset to the default filter. Lock payment method rule - If you offer multiple types of payment methods, like credit cards and checks, sometimes you want to lock the guest into one method. If you offered a check discount, you don't want them later paying by credit card. Skip renter agreement rule - Sometimes you'll need to skip a renter agreement, or you have a third party signing service you use. This rule lets you turn off the renter agreement signing step for a property or quote. Rules batch update - If you have lots of properties and make a rule change, that can be a lot of work to update every single property. That's why we added a batch update for rules that lets you update other properties with the new rules, or update existing quotes and bookings with those rules as well. Processing Fee/Discount - If you offer multiple payment methods, like check and credit card, you can do a fee or discount for specific payment methods, like a check payment discount. If the guest chooses that payment method at reservation time, the fee or discount will be applied to the booking and the payment method type will be locked to the same type for future payments. Property Private Code and Public Name - We added two new options on properties that will show a different name than the standard based on context. The Private Code is used on reports and calendar legends so you can identify a property at a glance. The Public Name is used on guest communications, hosted websites, and widgets so you can include keywords for marketing purposes. Per-property theming - We've had headers/footers for email, forms, renter agreements, etc. Per property theming lets you create multiple "themes" which include logo, name, headers/footers, etc. and assign them to specific properties. Useful if you have properties in different areas or categories and want to project a specific brand for some properties. 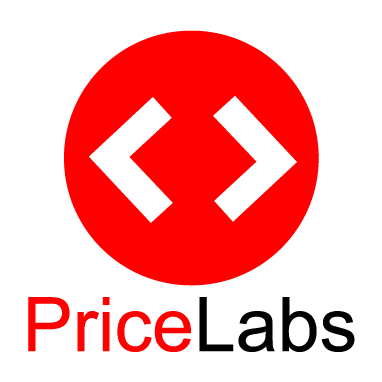 PriceLabs - This is our first dynamic pricing integration. Read more about PriceLabs integration. BeyondPricing and Wheelhouse are coming soon! ResortCleaning.com - If you manage your cleaners through ResortCleaning.com, you can integrate it with OwnerRez to pull booking info over automatically. More Processor Accounts - We added OpenEdge (formerly known as “PayPros”) support. YapStone/VacationRentPayment is in final testing. Line Item Pivot Report - Winning the worst named report award is the Line Item Pivot Report. It shows one row per booking, with columns for each type of surcharge, which is great for breaking down where exactly the money came from. Insurance Report - This report gives you a birds eye view of both damage protection insurance and travel insurance on a per-booking basis. Gaps Report - We added rules and trigger criteria for dealing with gaps automatically, but some times you just want to see where the gaps are. Maybe you want to reach out with a personalized phone call or email and see if the guest wants to add a night to the beginning or end of their stay. This report lets you find gaps by size and get a list of guests and contact info. Credit Card Processing Report - We added a report that shows all credit card transaction history, no matter if the transaction was accepted or declined by the processor/gateway. This shows you low-level details about transactions which you can use to track attempts made by the guest or see a running history on what was tried and by whom. Email triggers and templates is another area where we've made massive improvements, from new events to new trigger criteria to forecasting so you can see what triggers are queued to be sent. All booking criteria that have been available on surcharges, from number of nights, to dates, to number of guests. PM and Owner stats like owner amount, PM commission, pre-deducted expenses, etc. Property max guests, adults, bedrooms, bathrooms, registration number, etc. Trigger forecast - You've always been able to look at the Email tab of a booking to see what triggers will go out for that specific booking. The forecast lets you look across all triggers, or a specific trigger or template and see all bookings where it applies and the current send status. Emailing Owner Statements - You can email statements directly from OwnerRez instead of using your own outside email program. Once emailed, the statement shows a “Sent” indicator that you can search/filter on. More Field Codes - To help with emailing statements you can embed information about the statement including links to the generated PDF (which will auto-generate the PDF on the fly once the link is used). Bulk Create Statements - Have many owners to create statements for? You can now create them all in one click. You can save settings on each owner for what their default statement-generation settings should so that the bulk-create process know what to use for each owner. Bulk Emailing - You can bulk email many statements at once instead of going one by one. Custom Email Templates - You can create custom email statements for each owner so that when bulk-emailing statements, the owner gets the correct message tailored for their situation. Attachments on expenses - You can attach documents or photos to expenses for tracking purposes -- invoices, photos of work done, etc. Those attachments will be included when Owner Statements are generated. Grant Admin Access - You can now grant admin access to another OwnerRez user - useful for accountant access etc. This currently requires us to authorize the connection, so let us know if you need this. Expense and Fee standardization - We merged the concept of payment fees, host fees, and expenses so there is a standard way to deduct fees from commission and owner payouts. Our QuickBooks Integration went through two large updates this year, the last of which was a major overhaul. We changed how syncing works to correct a number of bugs and also added transparency between OwnerRez and QuickBooks records so that you can see what is being created on both sides. As I write this, we are actually finishing up another update on QuickBooks that will allow you to change settings for different surcharges, deposit accounts, invoice dates, invoice numbers and more. Looking back, the list of what we did in 2018 is pretty massive, but looking forward, the list of what we’re working on (and going to be working on after that) is even bigger! Thank you for your support and loyalty and feedback! We're very excited to announce our integration with PriceLabs! We've been hard at work on features to support this integration -- like the new Spot Rates concept that lets you "paint on top" of seasonal rates to set rates for specific days. To learn more and set up the integration, follow the instructions in our PriceLabs Integration Guide. PriceLabs is a powerful revenue management & dynamic pricing solution for vacation and short-term rentals. A data-driven approach, automation rules, and customizations to manage pricing and minimum-stay restrictions help vacation rentals increase revenues and save them hours in the process. The customization options layer on top of market data help you automate things like cascading minimum stays (e.g., lower min-stay as a date gets closer, reduce min-stay to fill gaps), last minute discounts, orphan gap discount/premiums while still giving you good control over your pricing strategy. Learn more in this short video demo! You may have wondered why it's been so quiet around here recently. We've been hard at work on a huge new feature: direct channel integration! We've had two-way iCal sync and inquiry parsing for years, which provides the basic availability updates and inquiry quoting and auto response. Direct channel integration has so much more potential: updating channels with rates, listing description, amenities, photos, receiving bookings with full financial and guest information, two way messaging with guests... and the list goes on from there. We directly control and are responsible for the integration with each channel. This means that we can deliver our trademark power and reliability rather than having to play telephone through a third party to get to the channel. Channel managers are EXPENSIVE! Some charge 3-5% of the gross booking total on top of the already large commissions that each channel charges. As vacation rental owners ourselves, we know how steep of a price that is. They justify it by saying, "just build it into your rates", but that means your booking volumes go down. Building direct integrations takes longer but lets us price on a simple per-property flat rate (see below). Many channels require a minimum of 5 properties to access any direct integration. For smaller folks, we've developed a channel bridge tool that links into the same channel sync engine but bypasses the 5 property limit. The promise of being on "hundreds" of channels rings hollow. The key is to be on the big 5 or 10 channels in your area and the rest are a distraction. More channels means more work and more things that can go wrong -- even with a channel manager you still end up running around doing little one-off fixes... and you end up being limited in pricing and policy decisions to what is supported by the lowest common denominator channel. You've seen a lot of "coming soon" language on OwnerRez this year, and we recently centralized the direct and synced channels into a main Channels area. All of that is currently free while we're in beta. Synced channels (iCal and inquiry parsing) will always be included with the base OwnerRez subscription. As of 1 December, direct and channel bridge channel integrations will become a premium feature, which will cost $9.99/mo for the first two properties and $1/mo for each property after that. As a bonus for our customers, whether you've new or have been with us for years (those of you around since 2009, thanks for making this all possible!) we're waving the $9.99 fee for the first year for anyone who signs up by 1 December. You'll just pay a flat $1/mo per property for premium channels until December 2019. We've got great plans for more channels and more channel related feature throughout the rest of the year and into 2019. As vacation rental owners ourselves we're salivating over the possiblities and can't wait to get all of this stuff done! The current roadmap starts with booking.com content push, then into VRBO/HomeAway and Airbnb content push (both via channel bridge for everyone and direct integrations for 5+ property users). After that we'll branch out into additional channels like Expedia and Agoda, and then fully integrate seamless messaging through all sources (channel direct, SMS, email, phone, etc).